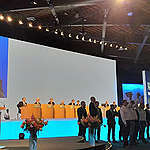 20 Greenpeace Switzerland activists interrupted Nestlé’s Annual General Meeting (AGM) by lining up in front of the shareholder audience, displaying banners that said “Nestlé stop single use” and “Nestlé, this is yours” while holding up the company’s throwaway plastic found polluting the world’s oceans. The activists then handed the plastic waste to the Nestlé executives and returned to their seats. Greenpeace is demanding that Nestlé and other multinational corporations be immediately transparent about their overall plastic usage and put forward concrete action plans with ambitious timelines for how they will reduce their reliance on single-use plastic and move beyond the throwaway culture. Nestlé was one of the top corporate plastic polluters identified in a worldwide cleanup and brand audit effort conducted by the Break Free From Plastic coalition last year. Full results here. Greenpeace’s accompanying campaign video entitled “Nestlé’s Plastic Monster” is available here.